Yielding to unrelenting pressure from the pro-democracy movement, King Gyanendra of Nepal tonight met a key demand of the Seven-Party Alliance (SPA) by announcing that Parliament, which he had dissolved in 2002 would be revived. Defying the curfew imposed for the sixth consecutive day by the Royal Government, tens of thousands held rallies in the Nepalese Capital today as security forces clashed with protesters injuring over 30. 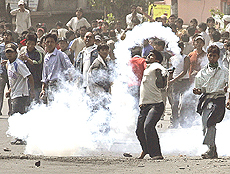 A pro-democracy activist throws a tear gas canister back at riot policemen while defying a curfew in Kathmandu on Monday. Are government officials oriented towards public service? India and Germany today pledged to continue close cooperation in the fight against terrorism, called for comprehensive reforms of the United Nations Security Council and announced their decision to start negotiations on a treaty on mutual legal assistance in criminal matters for its early conclusion. 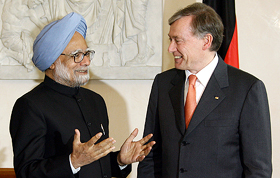 Prime Minister Manmohan Singh chats with German President Horst Koehler prior to talks in Berlin on Monday. Of course, this was a great year for me but I want to improve it further in the next year. The Aligarh Muslim University (AMU) will continue to be a minority institution in terms of the 1981 constitutional Amendment. A Bench comprising Mr Justice K.G. Balakrishnan and Mr Justice D.K. Jain while issuing notices on a petition filed by the AMU and the Centre to the respondents referred the matter to a five-judge Constitution Bench. The condition of BJP General Secretary Pramod Mahajan, who is recovering from gunshot wounds inflicted by his brother, worsened today. According to information available from Hinduja Hospital, where he is undergoing treatment, Mahajan has been put on dialysis after the functioning of his kidneys turned abnormal. Virtually ignoring the call for the boycott of byelection to the four Assembly seats in Jammu and Kashmir today, more than 62 per cent voters cast their votes. A woman checks her voting slip before casting her vote during byelection in Pattan, 30 km north of Srinagar, on Monday. With 48 hours left for the Assembly elections to begin in Kolkata and the adjoining two 24 Parganas districts, which will decide the future governance of West Bengal, both the ruling Left Front and the Opposition parties, have launched massive campaign in favour of their respective candidates.